Brommtopp artifact, on display at Mennonite Heritage Village. Although it is a little quieter during the winter months while the village is closed and under a blanket of snow, I’ve learned over my first year here that life at Mennonite Heritage Village (MHV) is always interesting. As a curator, one of the fun parts of my role at the museum is to be able to interact with a variety of people who come to the museum with a range of interests, sometimes in very specific topics. This aspect of my work presents the opportunity, and the challenge, to delve into a subject area or a part of MHV’s collection of over 16,000 artifacts that I don’t get to talk about every day. Today, MHV hosted the crew of an upcoming film called That Mennonite Joke. This documentary focuses on questions about Mennonite humour, where it comes from, and what makes it funny. I got to spend the afternoon guiding the film’s host, comedian Matt Falk, through MHV’s permanent gallery, discussing the history of the Russian-descendant Mennonites in Manitoba and some of the artifacts in our collection that speak to the topic of Mennonites and humour. One of the artifacts we talked about at length is the replica of the Brommtopp that is on display at our museum. 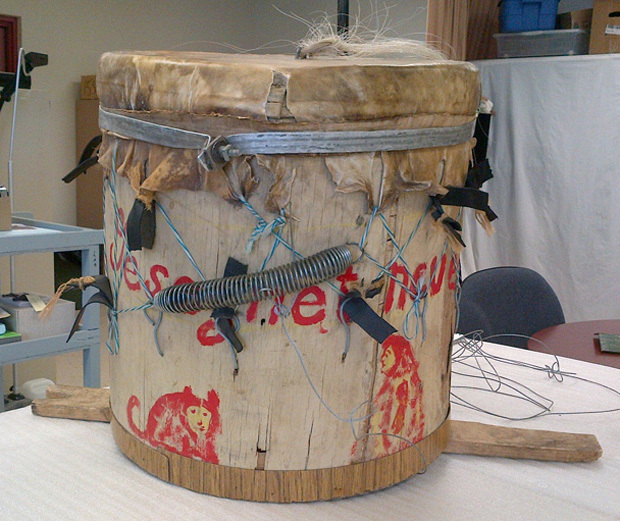 The Brommtopp is an instrument that was part of a Mennonite New Year’s Eve mumming tradition. It had a main role in the festivities of the evening, in which a troupe of about a dozen costumed young men went from house to house, entertaining their hosts by playing the instrument and singing “The Brommtopp Song,” often in exchange for coins, food like the traditional New Year’s fritters called Portzeltje, and sometimes liquor. The tradition and the instrument are said to have roots in Prussia and were brought with Mennonites as they migrated to Russia and later to Manitoba. Our particular Brommtopp was built by Cornelius R. Falk in 1970, based on his childhood memories of seeing and hearing the instrument played as a child in Edenberg, Manitoba. He recalled being both excited and terrified by the strange thrumming sound that the instrument produced and by the sometimes raucous behaviour of the Brommtopp troupe. So, what’s so funny about a Brommtopp? Humour often results from social situations of disjuncture; something happens outside of the usual expectation of everyday life. In the case of the young men in the Brommtopp troupe, the social norms that governed everyday life in Mennonite communities – like modesty, decorum, or even sobriety – were all turned on their heads. The Brommtopp troupes were often purposefully loud, disruptive, rowdy, raucous and sometimes crude, and their costumes and behaviour played on ethnic and gender stereotypes of the “other.” Many of the social codes that governed Mennonite community life and the way neighbours interacted with one another were broken. But on this one occasion, and within the structure of this New Year’s Eve tradition, the behaviours that were associated with the Brommtopp, not tolerated or permitted in other social situations in Mennonite life, were suddenly permissible. If you are interested in seeing this strange instrument in person, it is on display in the “Community Life” section of MHV’s permanent gallery.